Having learnt more about the Year Abroad experiences of our own students in recent weeks, today French Erasmus student Amélie Doche tells us a bit about her experiences in Liverpool, where she will be spending this academic year. My name is Amélie. I am a French student, aged 21, and I’m here at the University of Liverpool for the whole academic year – cheers, Erasmus programme! I’ve been studying English language, literature and history for two years at the Université Jean Moulin Lyon III. I absolutely love the English language… I must say, I find it very pleasant to hear – and even more so if you come from the North of England! I feel that, when you study a modern language, it is important to “experience” it, almost to “lose yourself” in it. I’m not saying that you cannot learn a foreign language at the university –in fact, I definitely think that you can – but a foreign language is not just about learning new words. Every language is strongly linked with the culture with which it is associated. So, why did I choose Liverpool? Well, I wanted to live in a big city where there is always something going on. And I also wanted to be rather close to the countryside (to fulfil my romantic need for nature and green areas perhaps?). Seems like Liverpool is a great location for me! There was also this popular cliché that people who live in the North of England are more welcoming that their fellow countrymen in the South. It might have influenced my decision without my consciously knowing it! For those of you who’d like to study/work as a teaching assistant in France next year, feel free to contact me! The run-up to the end of term brings with it extra pressure on students, especially those in their final year, as coursework submission deadlines loom. In this short blog post, one of our finalists, Lucy Kay, allows herself a spot of reminiscing as she shares with us experiences of her Year Abroad. Hi, my name’s Lucy and I spent my year abroad in Metz, France, where I worked as a language assistant for the British Council. Metz might not have seemed like an obvious choice for many (in fact, many French people raised their eyebrows when they heard I had actually chosen to come to the capital of the Lorraine region! ), but it really worked for me. A deciding factor for the location of my year abroad was being in proximity to the eastern border, as I wished to visit other countries during my stay. Spending my weekends off visiting Luxembourg, Belgium, Germany and Switzerland was a definite plus! For any students deciding to choose the British Council pathway for their year abroad, I would really recommend it. Working as an assistant guaranteed a pre-established network for me to become a part of, which definitely made things easier during my first days in France – and having colleagues to ask for advice is really helpful. The work experience in itself is invaluable, as is the fact that you’ve already lived and worked abroad when you come to graduate. I think the biggest benefit of my time away is showing itself now that I have returned to classes at the university. My improved ability and confidence has definitely reinvigorated my enthusiasm for the subject and has made me look at studying French in a new way. The global outreach of the year abroad is something that really struck me. Although I was living in France, I made friends from all over the world and we were all connected by the fact that we were learning a second language. It really makes you feel like a part of a bigger network, and helps you realise that there are so many opportunities that arise from studying languages. Over the summer, two students from Italy spent the summer in Liverpool as part of the Erasmus+ Traineeship scheme. 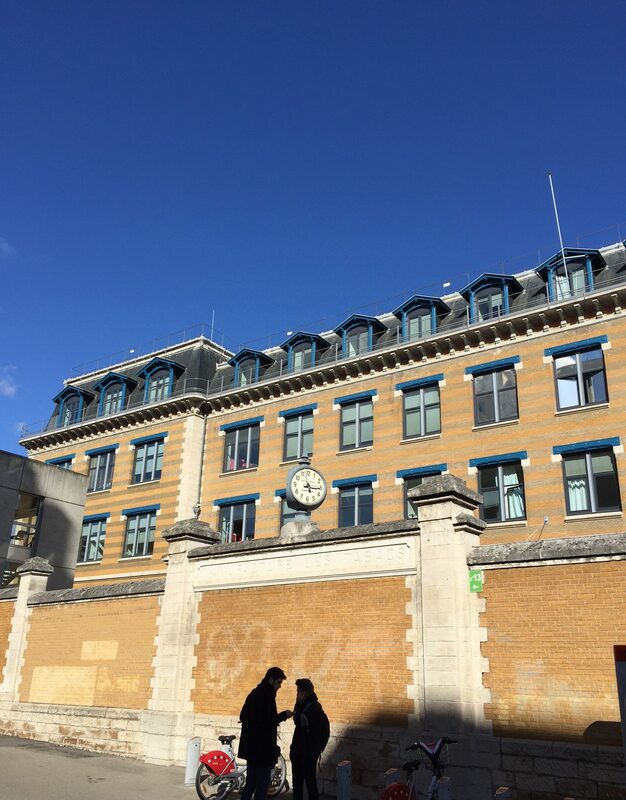 In this short blog post, they tell us about their experience in the Department of Modern Languages and Cultures. We are Annalisa Porcelluzzi and Annamaria Trimigliozzi. We are currently studying for an MA in Specialized Translation at the University of Bari, in Italy. Over the summer, we had the chance to participate in the Erasmus+ Traineeship scheme that led us to Liverpool to join the Department of Modern Languages & Cultures. We spent three months as honorary fellows in Italian and too the opportunity to learn more about how to prepare exercises for examinations and search for appropriate materials for teaching Italian as a foreign language. We were also able to assist Dr Rosalba Biasini during Italian exams, which was indeed a very interesting experience since they were different from the exams we are used to in Italy. Furthermore, we collected useful information about Italian universities and about opportunities for students who would like to study in Italy during their Erasmus placements. In turn, we provided plenty of information about the University of Bari, as we also took our undergraduate degrees there, in Linguistics and Intercultural Communication. Thanks to this amazing opportunity, we developed a deep knowledge of how a British university works and it certainly was a valuable experience in a field we are really interested in, and which we hope to pursue in the future. Moreover, the experience allowed us to explore different parts of the United Kingdom and to learn more about this wonderful country, full of culture, traditions, breathtaking landscapes, and beautiful but challenging accents! The experience would not have been the same without the precious help and support that we received from our colleagues in Italian, whose professionalism was complemented by their capacity to help us feel welcome and at ease during our stay. We hope that we will have the possibility to join them once again in the future. As we move into Week 9 of the Autumn Term, we catch up with another of our graduates, Chris Pover, who graduated with a first class degree in German and Economics, including a distinction in spoken German. I am currently in my first year of the three-year Grant Thornton Business Advisory Graduate programme. I studied German and Economics at the University of Liverpool, and whilst my degree choice was suited to the graduate scheme, I genuinely believe that it was my year abroad experience that gave me an edge over other candidates in the application process. For my year abroad, I chose to do a business analytics internship for Atos, an IT company based in Munich, and the transferable skills I gained throughout the year were invaluable to me, both professionally and personally. I was able to experience life in the field of work of my choice before finishing my education, something many graduates aren’t able to include on their CV. I am also very grateful to have worked closely with others in an international team, where I was able to learn a lot from my colleagues’ different experiences. Munich is a bustling city with lots going on, so meeting people my age wasn’t too difficult. I found a group of friends with whom I watched the legendary Bayern München play (and win of course) at the Allianz Arena, I explored the Bavarian countryside and some of Austria, visited many a beer hall and, of course, dressed in Lederhosen for Oktoberfest! My year abroad was certainly one of the most challenging yet most enjoyable years of my life so far, and I would do it again in an instant. I met friends from all over the world with whom I spent a year having fun, and when paired with my time as an intern at Atos and my education from Liverpool, I felt confident to begin the graduate program with Grant Thornton. A couple of weeks ago, MLC played host to Iberian and Latin American Week. In this blog, three of our students – Laura McFadden, Rebecca Mayo and Joe Corazón – share their experiences of the week with us. From Monday 31 October to Sunday 6 November, the Department of Modern Languages and Cultures welcomed a plethora of guests from a wide range of Iberian and South American cultures. The week kicked off with a taste of Basque music, followed by a discussion of the Mexican celebration Día de los muertos and the Galician tradition of Noite dos Calacús, and concluding with another musical showcase, this time of Mexican and Galician songs. On Wednesday, we had to put on our dancing shoes in order to learn a range of Latin moves and grooves. Spanish lecturer Nelson Becerra-Gonzalez stole the dancefloor with his eye-catching cumbia routine, which put everyone in high spirits for the evening’s event. This involved a special performance by Catalan group Jansky, an electroverse duet who combine electro music with the spoken word. The impressive duo’s alternative type of poetry managed to turn The Caledonia pub into a little Catalonia. For a taste of their work, have a look at the following link: https://youtu.be/2yzSiwZ3bKU. Give everything a go; that’s the whole point of Iberian Week! As well as bringing the cultures that we study at Liverpool to life, the activities on offer provided more direct support for our language work as well. For example, on Thursday, Blanca González from the University of Manchester gave a workshop entitled ‘Translating Spanish Culture: La Movida’. After introducing us to ‘La Movida’ (a cultural movement that began in Madrid after Franco’s death), we finished the workshop by translating ¿A quién le importa? – a song by Alaska y Dinarama – which was great fun and definitely improved our understanding of the translation process. Muchas gracias to everyone involved for putting on such a fun, informative and fiesta-filled week. Claire Taylor, Professor of Hispanic Studies, was invited to speak at a workshop on Screening the Literary: Writing Quality on the Web, which was organized by the Authors and the World group at the University of Lancaster on 28 October 2016. In this short Q+A, Claire tells us about the event and her contribution to it. So Claire, who organized the event and what was it about? The event was organized by the Authors and the World group, which is an AHRC-funded collaboration between researchers in the departments of European Languages & Cultures, English & Creative Writing, Linguistics, and Contemporary Arts (LICA) at Lancaster University. Their aim is to interrogate the literary, social, political, linguistic, and historical significance of the author as a cultural artefact and a producer of literary texts. The one-day workshop focused on how the digital environment affects authors’ approaches to writing, in terms of practice, aims, and content. It looked at issues such as to what extent the concept of ‘literariness’ changes in a digital context. It had a comparative approach, bringing together scholars working in French, German and Hispanic contexts, as well as practitioners. Were there any outstanding moments in the day? Everyone gave great papers, with much food for thought, so it’s hard to choose! That said, what perhaps stood out most for me was the presentation by Claire Dean, who is both author and scholar, and told us about her creative writing practices. In her talk, entitled ‘Making Wonder Tales: Developing a Digital Writing Practice’, she not only made us re-think the terminology that we use to describe creators today, but she also gave us fascinating insights into her creative practice that brings together writing, digital technologies, and material artefacts. For instance, she told us about her projects that have, amongst other things, used technology to connect to MOSS, capture environmental data to determine what stories would be available online, and use mapping and altitude levels to generate stories. It was really exciting to hear about her practice, and to hear from an author herself about how she negotiates new technologies. What was your contribution to the workshop? I was invited to speak specifically about Hispanic Digital literature, so I chose two examples: the Spanish-Argentine author Belén Gache, and the Latino author Eduardo Navas. My talk was entitled ‘From Print to Tweets: Tracing the Heritage of Digital Genres’, and I argued that these two authors demonstrate in their works a dialogue with existing, pre-digital genres; in other words, that, all the while using new technologies, they speak back to a rich, non-Anglophone tradition of literary experimentation. I looked at how their dialogue with pre-digital literary movements is both critical and self-aware, and how they update prior literary genres for the twenty-first century. 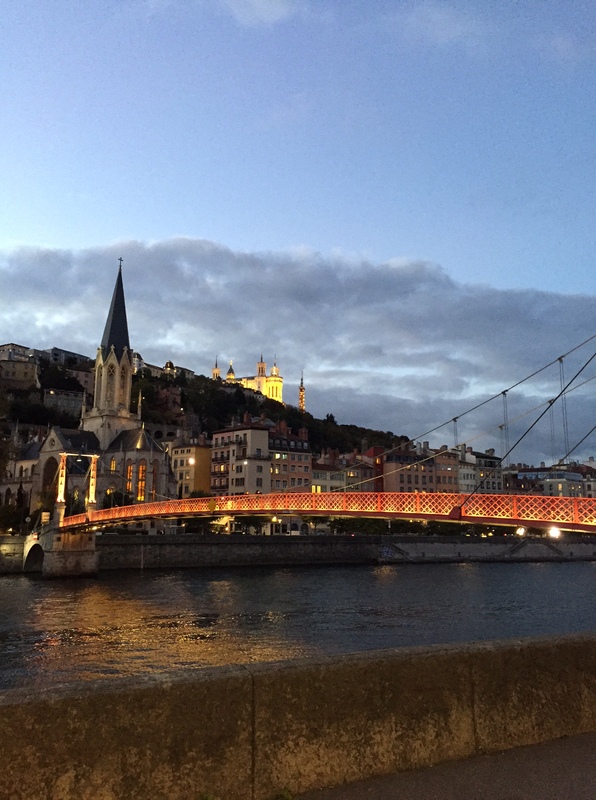 Dr Robert Blackwood has recently been to the city of Lyon to visit one of Modern Languages & Cultures’ Erasmus partners in France. Jean Moulin Université de Lyon III is one of the department’s half a dozen Erasmus student exchange partners in France, and has long been one of the most popular destinations for students of French spending one or two semesters of their year abroad in a French-speaking country. Lyon, France’s third city, is also one of France’s main university cities, and the three universities in the city mean that only Paris and Marseilles boast higher numbers of students. Lyon III is based in a converted cigarette factory in the east end of the city, and focuses on subjects within the arts and humanities. During this visit, Dr Blackwood met with the three Liverpool students currently studying at Lyon III: Manja Drasler, Eleanor Parker-Coates and Charlotte Hughes. Manja and Eleanor are in Lyon for the whole academic year, whilst Charlotte moves on to Spain in semester two. 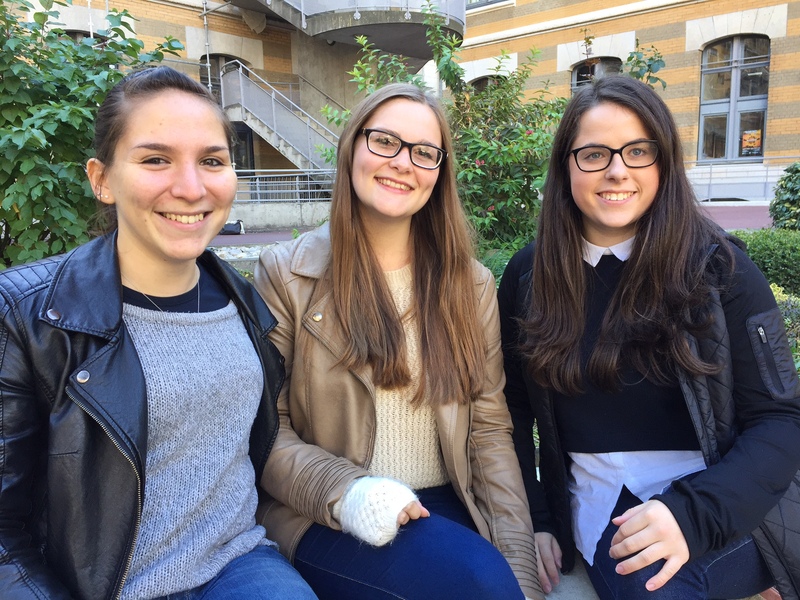 The three of them have enrolled in a range of modules, ranging from history and translation through to the mandatory French-Erasmus-students and French civilisation modules. Dr Blackwood also had the opportunity to meet with academic and professional services colleagues at Lyon III to discuss module provision, pastoral oversight, and the extension of their English-language teaching portfolio, which might be of interest to colleagues across Histories, Languages & Cultures.